The folks over at CarScoop have a few photos of a Toyota Yaris that's been quite extensively modified for the 2009 Melbourne Auto Show. 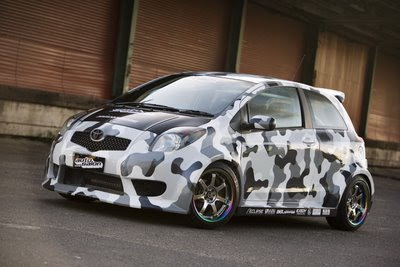 The black, white, and gray camouflaged Yaris has a host of modifications (it even has as Micro Image sticker!) including Rays Engineering wheels, TRD stuff, Exedy clutch, and a lot more!